Jo began her career working in a Dr Barnardo’s home for children in Kent after which she moved to London and trained as a psychiatric nurse – a subject which often features in her comedy. As a nurse, Jo dealt with drug addicts, alcohol abuse and the clinically depressed on a daily basis. She quickly discovered that it was her sense of humour that kept her going. 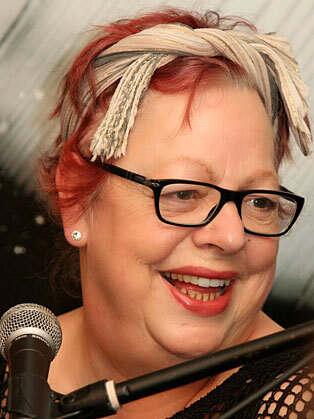 Since leaving her job as a psychiatric nurse in 1987, Jo Brand has built a large following across the UK, male and female alike. In 1993 she became a resident panellist, along with Tony Hawks, on BBC monologue show The Brain Drain. Soon after, she had her hit “Through the Cakehole” (Channel X for Ch4) series met with great acclaim, as did her series “All the Way to Worcester” (Vera Prods for Ch4). Jo’s diverse appeal is marked by appearances on such eclectic programmes as “Question Time” (BBC) to “Nevermind the Buzzcocks” (TalkBack Prods for BBC) and “Countdown” (YTV for Ch4) to “They Think It’s All Over” (TalkBack Prods for BBC) and The Graham Norton Show (BBC). She presented “Jo Brand’s Commercial Breakdown” (Celador for BBC1), “Jo Brand’s Hot Potatoes” (Assembly Film & TV) and “Jo Brand’s Rudest Home Videos” (ITV1). She has just guest hosted “Have I Got News For You” (Hat Trick). She also appeared on Star Spell, a spin off from Hard Spell, during 2004, and in a bloomin’ fantastic cameo in Absolutely Fabulous. In 2007, Jo narrated ‘Laughter & Tears: The Les Dawson Story’, a documentary tribute to Les Dawson. The programme was broadcast on BBC Radio 2 in October 2007. Jo showed a very different side to her talents on the first celebrity version of ‘Comic Relief does Fame Academy’ in 2003, and then in 2007, she appeared as a celebrity contestant on ‘Comic Relief Does The Apprentice’, again to raise money for ‘Comic Relief’. In 2009 she participated in ‘Let’s Dance for Comic Relief’, another ‘Comic Relief’ fundraiser, dancing as Britney Spears, reaching the final. She has proved herself an un-willing fashion victim on the BBC1 special ‘What Not To Wear On The Red Carpet’, learnt the organ for BBC’s ‘Play it Again’, which she then played to a sell out crowd at the Royal Albert Hall, and she has also taken part in a charity celebrity carol singing choir! She appeared as a judge in the BBC2 series ‘The Speaker’ in April 2009. She offered her advice, along with John Amaechi and Jeremy Stockwell, in the eight-part series charting the search for ‘Britain’s Best Young Speaker’. This year saw her write and star in the utterly marvellous, ‘Getting On’, in which she starred along co-writers Joanna Scanlan and Vicki Pepperdine, on BBC in July 2009. The series, set on a hospital’s geriatric ward, was partly inspired by her earlier career in nursing, and has been commisioned for a second series to begin filming in 2010. A critically acclaimed writer, Jo has written the hits ‘A Load Of Old Balls’ and ‘A Load Of Old Ball Crunchers’ (both Simon & Schuster), ‘It’s Different For Girls’, ‘Sorting Out Billy’ and ‘The More You Ignore Me’ (all for Headline Review). Her autobiography ‘Look Back In Hunger’ is also available.